Deadline extended to August 22, 2016 so please get your comments in. Below is what Marybeth Devlin sent in. This letter responds to the public-comment period currently underway regarding the management of the wild burros whose dedicated habitat is the Black Mountain Herd Management Area (HMA). I submit these substantive comments — questioning the accuracy and integrity of BLM’s analysis — and new information relevant to the analysis that should have been considered but was not — as an interested party in behalf of the Black Mountain wild burros. Please note that in all instances where text has been emphasized, either through bold and/or italics, the emphasis was added by me. For ease of reference, below are the respective links to BLM’s press release and to the Webpage where the Dear Reader letter and the EA are posted. BLM received an unsolicited proposal from Humane Society of the United States (HSUS) to conduct a pilot study on the use of porcine zona pellucida (PZP), also known as ZonaStat-H, an EPA-registered pesticide that induces infertility, on as many as 165 wild jennies of the Black Mountain herd. HSUS would endeavor to determine the effects of PZP on individual jennies and on herd-structure following treatments. HSUS would particularly focus on whether remote “opportunistic” retreatment methods could work. HSUS would collect and maintain data-sheets, and submit them as well as an annual progress report to BLM for review. HSUS has requested $33,695 in funding from BLM over 3 years. BLM reviewed the proposal and has now issued a preliminary EA, accepting public comments before issuing a decision. The jennies would be captured via bait-trapping and then transported to a holding facility for injection with PZP. They would be held captive for the next several weeks in order to administer a second “booster” injection of PZP. Most (70 to 100) of the jenny-subjects would also be freeze-branded with three digits on both hips for HSUS and BLM’s convenience in identifying them. Such permanent freeze-marks are typically 3½ or 4 inches high, and the letters are wide. Following the injections and branding, the jennies would be transported back and released into the HMA. Although field-darting would be attempted for the annual retreatments, the EA acknowledges that it might be necessary to bait-trap the jennies again for that purpose as well as in order to freeze-brand them a second time or to allow veterinary treatment of abscesses at the injection-sites. Thus, program funds would be spent for rounding up the test-subjects yearly, and the costs thereof would be over-and-above the grant for which HSUS has applied to conduct its study. HSUS is a leading advocacy-organization for animal-welfare. It provides leadership to advance the cause of humane treatment of animals. In response to BLM’s abusive helicopter-roundups and scandals involving wild horses and burros being sold into slaughter, HSUS sought a compassionate way to manage the mustangs on the range. It was a noble goal, and PZP was proffered as the answer. PZP / ZonaStat-H was touted by its manufacturer as “so safe it is boring”  and its contraceptive effects, as reversible. Relying on the manufacturer’s representations, HSUS applied to the Environmental Protection Administration (EPA) to have the product approved for use on wild horses and burros, which the EPA did — as a pesticide in cases where mustangs were deemed to have become a “nuisance.” So highly respected was HSUS’ reputation, that EPA waived certain protocols that are normally required. Unfortunately, HSUS failed to fully investigate the product beforehand, has not done so subsequently, and does not seem interested in knowing about any drawbacks to its use. Consequently, HSUS is ignorant of the body of science weighing against PZP. Now, HSUS is seeking to conduct a study of PZP on the subject herd of wild burros. But because HSUS is the registrant of the pesticide PZP, a conflict of interest is apparent. HSUS has a stake in the outcome of the proposed study, namely, to see it succeed and to ignore ill effects. Lacking scientific impartiality, HSUS must be disqualified from studying its sponsored product and from using taxpayer money to experiment on America’s underpopulated wild burros. The EA relies heavily on reports issued by PZP’s manufacturer regarding product-safety and lack of adverse effects. However, such data is suspect because the manufacturer has a stake in promoting its product. Lacking scientific impartiality and having a financial interest in the outcome, the manufacturer has an apparent conflict of interest. Therefore, independent studies should compose the majority of the references regarding the use of PZP; however, that is not the case. Indeed, as will be addressed later in this letter, numerous independent studies have been conducted, and they revealed many adverse effects of PZP. BLM and HSUS have ignored and BLM has suppressed independent scientific findings about PZP’s adverse effects and unintended consequences. Instead, BLM and HSUS continue to rely almost exclusively on the manufacturer’s claims regarding PZP’s safety for use on burros and horses, and for handling by humans. In fact, independent research — and even one study by the manufacturer — disclosed that PZP is hazardous to burros, horses, and humans. BLM and HSUS are thus non-compliant with the Policy and malfeasant in their responsibilities to protect staff, volunteers, and the wild burros and horses. The rationale for using birth control on the Black Mountain burros is predicated on false assumptions — “virtually no natural predators” and “herd sizes can double nearly every four years” — and fraudulent figures — reported herd-growth numbers many times over the biologically plausible. It is wrong to proceed when the premises-for-action are counterfactual and fraudulent. In the EA, BLM attempts to separate the premises from the proposal; however, the two are inextricably linked. Long story short – if your predators are not doing well, chances are the rest of the ecosystem is performing poorly. Wolves also prey on burros. However, Arizona’s wolves had been intentionally exterminated by the Federal and State governments to placate livestock-ranchers and to please trophy-hunters. Both groups — ranchers and hunters — continue to oppose the wolves’ right-to-exist. However, their reasons are self-serving. As is evident, BLM incorrectly equates births with herd growth. BLM wrongly assumes that all foals survive and that all adult burros live forever. However, adult mortality must also be taken into consideration when estimating herd-growth. Adult wild burros succumb to illness, injury, and predation. Others are shot and killed by unethical parties. Still others perish from stochastic events — random catastrophes such as an epidemic or a wildfire. Adult wild burros are believed to have a mortality rate of at least 5% a year. So, what is a normal herd-growth rate among wild burros? A good estimate would be about 2%, probably less. Thus, a burro herd could not double in 4 years, debunking yet another false premise held by BLM. BLM’s press release starts off by announcing that there are 5,000 wild burros in Arizona. The inescapable purpose of citing a state-level population instead of the subject herd’s population — which is the only one under analysis for the EA — is to prejudice the public against the burros, to “build a case” that the burros are seemingly “overpopulated.” Such manipulation of the numbers evidences lack of scientific integrity on the part of BLM staff. Figure 2 of the EA purports to show, in visual format, how “unchecked herds double in size every 4 years.” Figure 2 is just another fraud perpetrated by BLM at the National level and now copied at the Field Office level. It is disinformation — propaganda, not science. Independent research and analyses have revealed that BLM falsifies its wild-horse-and-burro population-data. (3) From the Gregg et al. study’s finding of a 7% increase due to new surviving foals, but adjusted to take into account a conservative annual adult-mortality rate of 5%, which yields a net herd-growth rate of 2%. Note that the implausible growth rates compound, as each successive year is calculated per those that preceded it. The errors compound also, leading to population-figures that are biologically impossible, given the reproductive limitations of the burro species. The AML for the Black Mountain herd was set in 1996 at 382 to 478 wild burros. Black Mountain HMA comprises 925,425 acres, or 1,446 square miles. Thus, per the AML, BLM implies that each burro needs 1,936 to 2,423 acres, or about 3 to 4 square miles per burro. That idea that every little burro would need 3 or 4 square miles of range is preposterous as well as unscientific. Therefore, the AML is arbitrary and capricious. Note that 2,500 is not a maximum but a minimum size. Higher numbers would be better. Because neither the questioned population-estimate nor the present AML reaches the minimal threshold of 2,500 individuals, the herd is under-populated. Therefore, the Black Mountain HMA needs to have its herd-size baseline expanded accordingly. By increasing the AML, the HMA would be brought into compliance with scientific expertise concerning adequate herd size. The properly-set AML would be foundational to BLM’s best management practices (BMPs) relative to protecting and preserving this wild burro herd. Across all species, the median MVP was 4,169. The “bootstrapped 95% confidence bounds” MVP for all species ranged from 3,577 to 5,129. With regard to mammals, the median MVP was 3,876. The “bootstrapped 95% confidence bounds” MVP for mammals ranged from 2,261 to 5,095. Their conclusions: In general, conservation practioners should aim for an MVP of approximately 5,000. Specifically, the authors state: “… we recommend the upper 95% confidence limit of MVP ….” For all species and for mammals specifically, a round number — a numerical threshold — of approximately 5,000 can be used to inform conservation management practices. How Would the New Levels Look? Here are some numbers to compare and contrast. In order to make informed decisions and to manage responsibly, BLM must have specific genetic data on each member Black Mountain burro herd. Therefore, BLM needs to conduct a 100-percent evaluation of the Black Mountain burro-herd’s genetic health. This would be accomplished by taking DNA samples and sending them in a timely manner to the Equine Genetics Lab. Per the test-results, and per guidance from Dr. Gus Cothran and other equine experts, BLM must then reform the AML and develop best management practices to restore and maintain gene-pool diversity via a robust population-level. The AML must ensure an optimal burro-population — one that can easily self-sustain its diversity and viability, and that can bounce back from random catastrophic events. Sample current and continuing herd members. Sample first, before considering any actions. Sample large — 100 percent. Manage per test-results and best-available science. Some persons argue that, because PZP does not kill the mare or jenny, it is not really a “pesticide.” Actually, PZP does kill. As will be documented herein, PZP’s use is associated with stillborn foals. PZP is further correlated with stolen foals and out-of-season foals, who perish as neonates. In the long term, PZP tends to weaken a herd immunologically, which could swiftly lead to its extinction. So, yes, PZP is a real pesticide. HSUS, the registrant of PZP advised the Environmental Protection Agency that, based on information from the pesticide’s researcher-manufacturer, PZP works by generating antibodies that “block sperm attachment.” This representation of PZP as a sort of chemical condom was not fact but merely an untested hypothesis, postulated three decades ago. The old hypothesis was disproved by subsequent research. PZP’s manufacturer knew, or should have known, this. The manufacturer should also have been informed and up-to-date regarding the side effects and unintended consequences of PZP. Yet, the manufacturer continued to cite the disproved hypothesis and to deny that PZP has any adverse effects. [11 and 19] HSUS is remiss in not investigating PZP beyond the manufacturer’s claims before touting it as the solution to the non-existent burro-overpopulation “problem.” BLM is irresponsible in ignoring research that has disclosed PZP’s risks. Kaur & Prabha’s review concluded that PZP’s antibodies induce ovarian dystrophy, destruction of oocytes in all growing follicles, and depletion of resting follicles. The manufacturer of PZP as well as BLM should have been aware of these and other findings about the pesticide. Yet they ignored or disregarded any information that was contrary to their personally-preferred but obsolete and false description of PZP’s mode-of-action. One of the references cited in the EA was a study by Curtis, Pooler, Richmond, Miller, Matfield, and Quimby (2002) on the comparative effects of GnRH and PZP on white-tailed deer. However, the HSUS proposal would only examine PZP, not GnRH; so the Curtis et al. (2002) study would not be the most appropriate reference to use, especially in view of the fact that lead-researcher Curtis, along with most of the same colleagues — Richmond, Miller, and Quimby — issued a newer study (2007) on PZP alone. In a telling study, Kirkpatrick, Liu, Turner, Naugle, and Keiper (1992a), the lead author and manufacturer of Native PZP, along with colleagues, reported that ” … three consecutive years of PZP treatment may interfere with normal ovarian function as shown by markedly depressed oestrogen secretion.”  So, despite all the hype about PZP being non-hormonal, the manufacturer knew that ZonaStat-H has an adverse hormonal effect, causing significantly-lowered estrogen. Thus, PZP is an endocrine disruptor. The plummeting estrogen-levels may also reflect the ovarian dystrophy and oophoritis now known to be caused by PZP. Despite personally discovering negative hormonal impacts 24 years ago, PZP’s manufacturer continued to cite misinformation regarding the product’s mode-of-action and hid its endocrine-disruptor side-effects. As discussed above, PZP correlates with abnormal masculine behavior on the part of treated females, a side-effect likely due to elevated testosterone. But in addition to the endocrine-disruption caused by PZP, there could be a second way for testosterone levels to become elevated. Recall that PZP causes ovarian cysts. An Internet search on “ovarian cysts and testosterone” yielded results for polycystic ovary syndrome (PCOS) in women. Interestingly, one of the symptoms of PCOS is high testosterone levels. [26 and 42] The connection between ovarian cysts and elevated testosterone suggests that the ovarian cysts caused by PZP could — either alone or in combination with PZP’s endocrine-disruptor effects — lead to high testosterone levels in treated females, as evidenced by their masculinized behavior. Ms. Sussman of ISPMB further reported that several mares that are barren due to PZP treatments have stolen — and continue to steal — foals from first-time-mother mares. Although the kidnappers do care for the foals tenderly, they have no milk. Consequently, the foals starve unless ISPMB discovers the “crime” and can intervene in time to save them. However, when such stealing occurs on public lands, there is no one to rescue the foals. So, it is likely that PZP kills foals indirectly — by their being kidnapped by barren PZP-treated mares, further confirming its status as a pesticide. We can also infer that PZP’s population-reduction effect is probably due, in part, to foal deaths. Why Do PZP-Treated Mares Steal Foals? Ms. Sussman has observed that the PZP-treated mares appear to suffer psychologically from their barrenness. They seem unhappy and frustrated that they don’t have foals of their own. So, they steal foals to fulfill that unmet maternal need. Foal-stealing is yet another behavioral abnormality associated with PZP-use. Thus, PZP wreaks havoc beyond just the individual mares treated with it, disrupting the life of non-treated mares and threatening the life of innocent new foals. It is likely that the apparent “contraceptive” effect of PZP is due, in part, to the death of stolen foals on the range, where no one is there to save them. Whose foal has recently died. However, the kidnapper-mares in question are neither pregnant, nor separated from a neonate, nor grieving the death of a foal. If the unusual behavior is hormonally-induced, then it would seem that PZP has another endocrine-disrupting effect — and additional unintended consequences — causing social disruption and foal deaths. In view of the fact that PZP eventually — if not immediately — causes sterility, any foal could be genetically rare and precious. In many cases, a foal may be the only offspring of a certain jenny or jack. By using PZP on the Black Mountain burros en masse, BLM could endanger the herd’s genetic diversity. Tung, Agersborg, Bagavant, Garza, and Wei (2002) found that autoimmune oophoritis (ovarian inflammation) could be induced by injecting test-animals with ZP3 peptide. The researchers noted that autoimmune ovarian disease is a known cause of human premature ovarian failure. Here again, is causation of autoimmune disease by a ZP-type product. Humans and horses are both mammals. It is logical to conclude that ovarian failure also occurs in horses. This study confirms other research cited herein. Varras, Anastasiadis, Panelos, Balassi, Demou, & Akrivis (2013) disclosed that, in humans, autoimmune oophoritis carries the risk of the patient developing other autoimmune diseases. The correlation between autoimmune oophoritis and subsequent other autoimmune disorders weighs against injecting 165 jennies with PZP. A longitudinal study by Ransom, Hobbs, Bruemmer (2013) of three herds currently being managed by PZP — Little Book Cliffs, McCullough Peaks, and Pryor Mountain — found a prolonged parturition-season — it lasted 341 days. Ransom et al.’s finding of a nearly year-round birthing season supports the earlier finding by Nettles (1997). Thus, during its period of potential reversibility, PZP’s effects wear off unpredictably. Out-of-season births put the life of both the mare and the foal in jeopardy. Nature designed the equine birthing-season to occur in Spring, not year-round, and certainly not in the dead of Winter. I note that the Black Mountain EA also omitted the Ransom et al. (2013) study as a reference but did include an earlier study by Ransom, Cade, and Hobbs (2010) on PZP’s influence on issues of lesser importance: Time budgets, social behavior, and body condition. The 2013 study is certainly more relevant in terms of PZP’s potential impact to the very existence of the Black Mountain burros than was the 2010 report. The 2013 study’s important scientific findings should inform the decision-making process, but were left out. Thus, BLM did not use the best-available research. When I read the sentence referenced immediately above — that Knight and Rubenstein had “speculated” about PZP triggering infertility in as few as 3 years — it had a déjà vu quality. I knew I had encountered just that same dismissive-to-science word-choice before. Indeed I had. The 2015 Pryor Mountain Wild Horse Range Fertility Control Environmental Assessment DOI-BLM-MT-0010-2015-0006-EA contained that same sentence, word-for-word, on pdf-page 14. In fact, the entire paragraph that ends in that sentence was lifted directly from the Pryor Mountain EA. What’s more, most of the paragraph preceding that one was taken directly from the Pryor Mountain EA. Continuing on, I found example after example of such copying, with minor additions and modifications here and there referencing jacks and jennies instead of stallions and mares. Questions as to scientific integrity: The fact that the team of 9 BLM-Arizona staffers who prepared the EA copied extensively and word-for-word from another EA suggests that no true analysis was conducted. I wonder: Did they even read the studies they cited? Probably not. More questions as to scientific integrity: Pdf-page 48 of the Black Mountain EA identifies the BLM National Office staff who reviewed it. One of the reviewers is the former Wild Horse Specialist for the Pryor Mountain Wild Horse Range, and held that position at the time that the 2015 fertility-control EA was issued. Did the W. O. Senior Wild Horse and Burro Representative supply his old EA for the convenience of BLM-Arizona staff? Did he essentially approve his own EA, modified slightly to reference Black Mountain wild burros instead of Pryor Mountain wild horses? Knight & Rubenstein’s concerns support those of Gray & Cameron, who also questioned the supposed benefit of sterile mares’ extended life-spans. The abnormal numbers of aged, sterile mares count for census-purposes; but their presence disadvantages the younger horses, who become tageted for removal in order for BLM to achieve arbitrary management levels. Further, such mares no longer belong to the viable gene-pool. The same concern should be taken seriously with regard to jennies, especially in light of their lower fertility and alternating-year breeding cycle. These findings were disclosed in 1981 — 35 years ago. PZP’s manufacturer must have known about this dangerous effect, and certainly BLM should have investigated on its own whether there was any risk to the unborn or the nursing foal. Yet, the manufacturer continued to insist that there was no danger to the foal, whether born or unborn. And in fact, BLM regularly administers PZP to pregnant and lactating mares, who transfer the destructive antibodies to their fetus, via the placenta, and to their foal, via mother’s milk. Fillies whose dams were injected with PZP while pregnant or nursing will already have PZP antibodies cross-reacted with and bound to their zonae. Therefore, when those same fillies are injected later, it will be their second treatment, or potentially even their third. In fact, they could already have been sterilized in utero or while nursing, the treatment having been received prior to puberty, about which Knight & Rubenstein warned. Likewise, if the Black Mountain jennies were injected while pregnant and / or nursing, their filly-foals would have PZP antibodies inflaming their little ovaries. Subsequent injections could easily sterilize them in one shot, especially if given prior to puberty. Imagine if such a catastrophe were to befall the Black Mountain burros, whose herd-immunity would be eroded by PZP. Note that the Saiga deaths involved antelope-mothers and their calves. If Black Mountain’s few fertile jennies and their foals perished all of a sudden, that would leave just jacks and sterile old jennies. The herd would be composed of the living dead, reproductively speaking, its rare alleles extinguished. BLM would be failing to proactively manage the Black Mountain herd with stochastic events taken into consideration. That would constitute malfeasance. PZP is a tool of immunological destruction, not of proper management. As the EA acknowledges, the Black Mountain herd would likely also be subject to annual roundups in order to re-inject the jennies, to re-brand them, and to render veterinary treatment of injection-site abscesses. What the EA refers to as “opportunistic” field-darting would probably not be adequate to “re-booster” enough of the test-subjects. 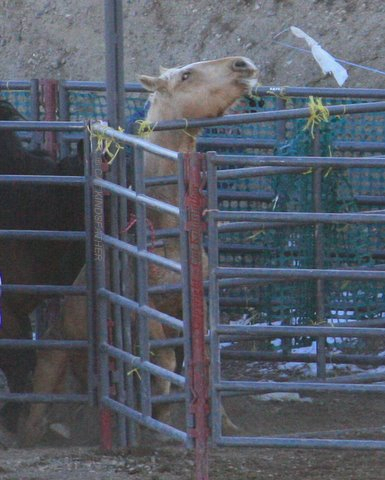 Roundups are stressful on burros and costly to taxpayers. The better and no-cost population-control method is predation by mountain lions, coyotes, and perhaps even reintroduced wolves. EPA’s Fact Sheet, the manufacturer’s training, and BLM’s operating procedures further fail to emphasize the magnitude of the risk — the PZP-in-question is a dose meant for a horse — or, in this case, a burro. In the EA, BLM has omitted independent scientific findings about PZP’s adverse effects and unintended consequences. Instead, BLM continues to rely almost exclusively on the manufacturer’s claims regarding PZP’s safety for use on horses or burros and for handling by humans. BLM and HSUS are thus non-compliant with the Policy and malfeasant in their responsibilities to protect staff, volunteers, and the wild horses and burros. The manufacturer of PZP — a partner to BLM — misrepresented the pesticide as safe for use on animals by humans. The manufacturer knew or should have known that the former hypothesis regarding PZP’s mode-of-action had been disproved, and that PZP has dangerous side effects, safety-issues, and unintended consequences. Yet he hid and denied that information and failed to warn about PZP’s adverse effects. The manufacturer cited his own research as if it were definitive, and aggressively criticized wild-horse-and-burro advocacy groups that oppose PZP, such as Friends of Animals and Protect Mustangs, and independent researchers whose findings did not fully support his claims. Indeed, he submitted an Op-ed to The Salt Lake Tribune wherein he accused Friends of Animals and Protect Mustangs of citing “dubious and distorted” data about PZP. He belittled the research of fellow scientists whose studies on PZP yielded results somewhat different from his own. His accusations were so unreasonable that the scientists felt it necessary to submit an Op-ed in response to defend the integrity and validity of their work. The manufacturer also disparaged members of the public — one of whom was appointed to the Pennsylvania Game Commission — that expressed concerns about PZP. He dismissively accused them of “an attempt to mislead,” of “hyperbole,” of “knowingly manipulating information,” of “attempts to frighten people,” and of indulging in an “anti-intellectual approach to debates.”  By these actions, the manufacturer violated the DOI Code of Scientific and Scholarly Conduct. BLM and HSUS staff and volunteers receive their training from PZP’s manufacturer in how to handle and administer the pesticide. BLM and HSUS are remiss in delegating the training to the manufacturer without verifying the adequacy of the instruction and the truthfulness of it. Two comments recorded recently in the media suggest that PZP’s manufacturer misled not just the public-at-large but those who received training therefrom in how to administer PZP. Recall that the manufacturer claimed PZP is “so safe it is boring.”  Independent research shows otherwise — that PZP is a powerful hormone disruptor that could sterilize a female with just one injection. If trainees believe that PZP is boringly safe, they will be less likely to protect themselves adequately from this dangerous pesticide. Indeed, many of the trainees are women and, therefore, particularly at risk. Likewise, wild-horse-and-burro advocates are lulled into complacency, trusting that PZP is harmless. Of course, none of that is true. Second, a PZP supporter, who self-identified as a recent completer of the PZP-darting training program conducted by the manufacturer, said in a comment posted to a news article: “I just received my FDA certification to handle and administer Native PZP. Would you be so kind to provide a link to the study you keep referencing? To my knowledge, and those teaching the Native PZP certification class, there are no side effects of the PZP produced by Dr. Kirkpatrick and his team, which is Native PZP.”  Key words: “no side effects.” It is disturbing that a person who was, no doubt, motivated by a desire to help the wild horses and burros has been disinformed regarding PZP’s safety-hazards to humans as well as to horses and burros. Cothran. 2010. Personal Communication. Conversation regarding genetics and related testing. This citation does not comply with APA standards for a proper scientific reference because a conversation is not “findable” or “retrievable” or “recoverable.”  Thus, the above personal communication cannot be verified. It should have been mentioned only in text, not in References. It was also odd that, in the intervening 6 years, a better reference was not secured. Evidently, the citation was intended in support of the following sentence, found on pdf-page 38. Extended length between generations provides for lengthening generation time and slows the rate of genetic loss (Cothran, personal communication 2010). But this sentence, too, had a déjà vu feeling to it. Sure enough, it was taken directly, word-for-word, from pdf-page 16 of the 2015 Pryor Mountain Fertility Control EA. In fact, the entire paragraph that contains the above sentence was lifted from the 2015 EA. What is more troubling is that the reader is led to believe that someone from BLM-Arizona actually had a personal communication with Dr. Cothran back 6 years ago. Surely, no such conversation happened. Thus, a fraud is being perpetrated against the reader in violation of scholarly-integrity principles. Over the very long-term (20 years or longer), if the results of the project are found to be effective in reducing jenny fertility rates (through extrapolation), there could be the potential for a reduction in competition for forage resources between ungulates (desert bighorn sheep, cattle, and burros). BLM assumes — incorrectly — that burros disadvantage bighorn (and cattle). That false assumption has been debunked. Wehausen (1998) concluded that “a negative influence of burros on bighorn sheep demography has not been shown as support for true competition.”  As to the alleged competition with cattle, that false assumption has been debunked too. BLM neds to stop the range-war, pitting burros against bovids. Forage-grazing is not a zero-sum game. Wild burros utilize coarse, old-growth forage. They are like lawn mowers. They take off the top growth — the dry, unpalatable layer. This grazing method enables the plants to put down deeper roots, and it prevents weeds from maturing to produce seeds. Grasses are encouraged by the burros’ frequent “mowing.” In addition, the fuel-load is reduced, helping to prevent wildfires. Livestock, in contrast, prefer tender new growth. They will even return to patches previously grazed — not rested — to get at that new growth. Thus, by consuming the old growth and making available the new growth, wild burros make conditions better for the range and better for livestock. Arizona needs more burros, not fewer. BLM procedures would call for the 165 jennies treated with PZP to be freeze-marked with three letters on both sides of their hips — left and right. Each of the letters would be 3½-4 inches in size. The purpose of these huge brands is to make it easy for HSUS researchers to spot and dart the jennies from a distance. First, please note that the Act prohibits the branding of wild horses and burros. The Act provides no exemption for BLM or HSUS. The disfigurement of burros is unacceptable. Surely, no jennies uglified with such blemishes would ever be adopted. Their marred appearance would also spoil the wilderness experience of eco-tourists who come to see the lovely burros in their natural habitat. Like Hester Prynne, the Black Mountain jennies would wear their prominent “scarlet letters” to announce their shameful status for the rest of their life, their only “sin” being their fertility, for which they would be punished. With regard to tracking and locating wild horses, BLM should employ inconspicuous electronic devices, such as tracking tags. The use of disfiguring freeze-marks must be prohibited. It should be noted that electronic tracking can also provide a record of each burro’s personal data for longitudinal studies. It is time for BLM to use modern methods instead of destroying the jennies’ beauty. As it is, most wildlife-tour visitors have to search long and hard to find any wild burros to view in the Black Mountain HMA. So, with 165 of the jennies injected with PZP, there would be fewer families, and especially, fewer darling “babies” frolicking on the range. The presence of foals delights recreational visitors; the absence of foals disappoints them. Forelorn, childless jennies disfigured with huge freeze brands on their rumps would be repulsive, and not what the public wants to see. Esthetics count, and recreation is fast-becoming the predominant use of our public lands. Please don’t ruin it for us.